Killing Rommel is an entertaining novel by Steven Pressfield about a fictional campaign by the Long Range Desert Group to kill General Rommel in 1942/3. I listened to the audiobook narrated by Alfred Molina who has long been one of my favourite actors. The book is an interesting and atypical war story because it's really the story of a series of debacles, wrong turns and disasters. The hero of the book Lt. Chapman is not particularly brave or inspired or gifted which makes us like him very much. He's an ordinary bloke (allbeit one who went to boarding school and Oxford) who makes mistakes, agonises over killing people and just about rises to the occasion when he needs to. The story is nuanced and reflects the odd code of honour that existed in the African theatre in World War 2. I loved the fact that the novel is actually a series of anticlimaxes and blunders, retreats and diversions, philosophical asides, long descriptions of engine mechanics, and ruminations on writing and literature - this is not what I had been expecting from a WW2 novel. I've read that Killing Rommel is being turned into Hollywood film by Gerry Bruckheimer which doesn't bode well considering his track record and I really hope that they don't change the characters or the strange stance and episodic structure too much. If I have one complaint about the audiobook its over Molina's accents - his New Zealanders sounded like South Africans to me and the voice he gave to Blair (Paddy) Mayne is a bit of a travesty in the fake Oirish department. Mayne was a legendary SAS commander who drove behind enemy lines in N Africa shooting up airfields, scouting German positions and gathering intel. 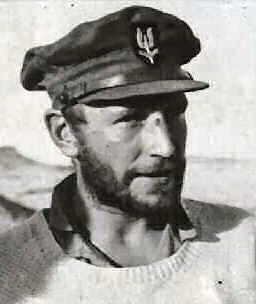 He was a famous rugby international before the war and one of the great characters of the desert campaign. (He really deserves a novel of his own.) Mayne was from deepest Ulster but when he appears in Killing Rommel Molina gives him the accent of a leprechaun from a Lucky Charms commercial. I'm sure very few people will notice this or care but when it happened it somewhat took me out of what is an otherwise fantastic audiobook.